CNY 2019: Hu8t deals at up to 70% off at Challenger!! Huat are you waiting for? Be the first 88 to get our daily prosperity ang bao! Shop now @ChallengerSingapore #03-17! 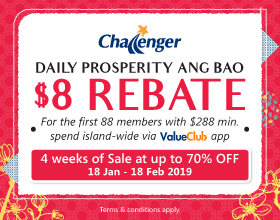 Terms and Conditions: Receive an exclusive $8 ang bao rebate with minimum of $288 nett spend storewide | Rebates are applicable for online and in-store purchases | At Challenger stores: Upon payment, scan and login via ValueClub App to enjoy this promotion | Limited to 88 members per day | Rebates will be created to member’s account within 10 days from date of purchase | Rebates are not exchangeable nor refundable for cash | Special buys and freebies available from 18 January – 18 February 2019 at Challenger Store.